Four flutes with a 45º helix, two serrated flutes and two continuous flutes. ISCAR has released the EFR B44 and the MM EFS Finishred solid carbide endmills. 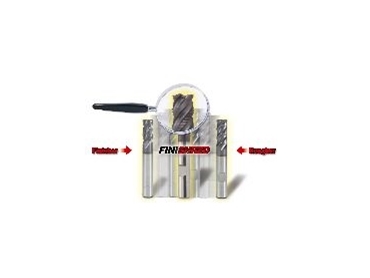 They combine roughing and finishing endmills in a single tool. Roughing endmills remove material from workpieces more rapidly and efficiently than conventional endmills but they leave grooves on the machined surface. After using a roughing endmill a finishing endmill has to be used in order to obtain a smooth surface finish. This means time-consuming tool change, setup time and maintaining two endmill types in stock. The EFR B44 and the MM EFS endmills have four flutes with a 45º helix, two serrated flutes and two continuous flutes. The cutting edges of the finishing flutes are radially further from the tool axis than the cutting edges of the serrated flutes. The finishing flutes remove the grooves caused by the roughing flutes, leaving a smooth surface finish. The tool enables running at rough machining parameters and reduces vibration at high load applications. It also produces short and long chips simultaneously. This chip mixture is evacuated more easily than each individual chip type, making the solution suitable for slotting and cavity milling applications.